A 61-year-old woman with suspected primary hyperparathyroidism was referred by her surgeon for preoperative imaging. Her recent total calcium was slightly elevated to 10.8 mg/dL (normal range is 8.9 mg/dL to 10.1 mg/dL). Her free (ionized) calcium and parathyroid hormone (PTH) levels were also elevated. The patient had a remote history of leukemia and was in remission since the 1990s. She underwent thyroid ultrasound imaging and 99mTc-sestamibi scintigraphy as part of her preoperative evaluation of primary hyperparathyroidism. Longitudinal and transverse ultrasound images of the left lobe of the thyroid (Figures 1 and 2) demonstrate a solid, hypoechoic (in reference to the adjacent thyroid), elongated homogeneous mass at the posteroinferior aspect of the thyroid gland. 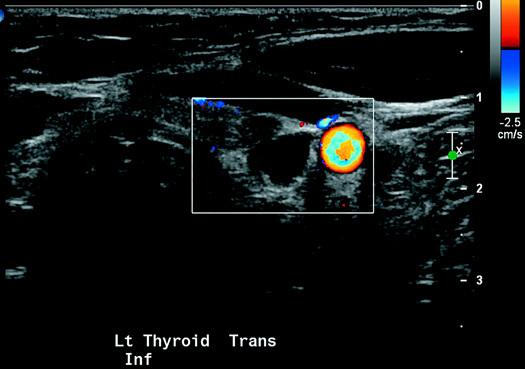 On the transverse ultrasound image (Figure 2), this suspected parathyroid adenoma is located medially to the common carotid artery. Anterior projection images were obtained after a 10-minute delay (early phase) and then after a two-hour delay (delayed phase) following the administration of 99mTc-sestamibi (18.44 mCi dose). Then 8.79 mCi of 99mTc-pertechnetate was administered, and the patient was reimaged (Figure 3). At 10 minutes, there is a focal area of increased activity in the region of the lower pole of the left lobe of the thyroid, which persists on the delayed-phase. Delayed images also demonstrate near complete tracer washout from the thyroid gland. Following the administration of pertechnetate, this parathyroid adenoma is again seen at the lower margin of the left thyroid lobe. Physiological tracer uptake in the myocardium, liver, salivary glands, and thyroid gland is also noted. Increased activity within the lungs is most consistent with sequela of disassociated pertechnetate. 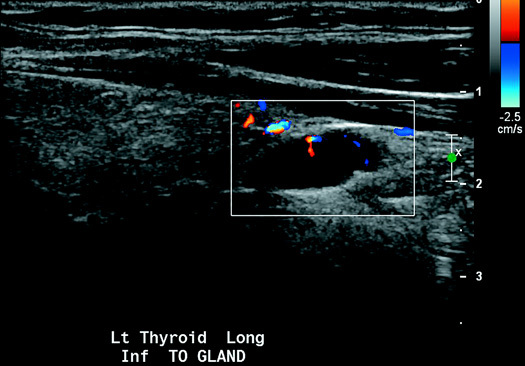 Based on ultrasound imaging and sestamibi scintigraphy, the parathyroid adenoma was localized to the lower pole of the left lobe of the thyroid gland. This was confirmed on postoperative pathology. Parathyroid glands maintain calcium homeostasis by producing PTH, which raises serum calcium. Primary hyperparathyroidism is diagnosed when serum calcium is elevated and PTH is increased or inappropriately normal. There are numerous, often nonspecific, clinical manifestations of hypercalcemia. The most common presenting symptoms include fatigue, hypertension, bone pain, muscle weakness, and psychiatric illness. Most cases of primary hyperparathyroidism are caused by a single parathyroid adenoma (89%). Other causes include parathyroid hyperplasia (6%), multiple adenomas (4%), and, rarely, parathyroid carcinoma. Parathyroid adenomas are benign tumors of the parathyroid glands. The majority of parathyroid adenomas are juxtathyroid and located immediately posterior or inferior to the thyroid gland. Up to 5% of parathyroid adenomas can occur in ectopic locations. Common ectopic locations include mediastinum, retropharyngeal, carotid sheath, and intrathyroidal. Accurate preoperative localization of parathyroid adenomas enables the use of less invasive surgical techniques. Thus, the primary benefit of preoperative imaging is the accurate determination of uniglandular parathyroid disease. Ultrasound and 99mTc-sestamibi scintigraphy are the dominant imaging techniques for preoperative localization of parathyroid adenomas. On ultrasound, parathyroid adenomas are homogeneous and hypoechoic to the overlying thyroid gland. They are usually oval or bean-shaped, and Doppler imaging commonly reveals a characteristic extrathyroidal feeding vessel. Normal parathyroid glands measure up to 5 mm and are uncommonly seen with ultrasound because they are isoechoic to thyroid tissue. Sestamibi with 99mTc is the most commonly used radiotracer for imaging the parathyroid glands. Sestamibi is taken up by both the thyroid and parathyroid glands, but adenomatous and hyperplastic parathyroid tissue shows more avid uptake of the radiotracer and often retains the radiotracer longer than thyroid tissue. Thus, early-phase planar images will show both thyroid and parathyroid tissue. Asymmetric foci of increased radiotracer uptake on early images, if seen, may represent abnormal parathyroid tissue superimposed on the normal thyroid. 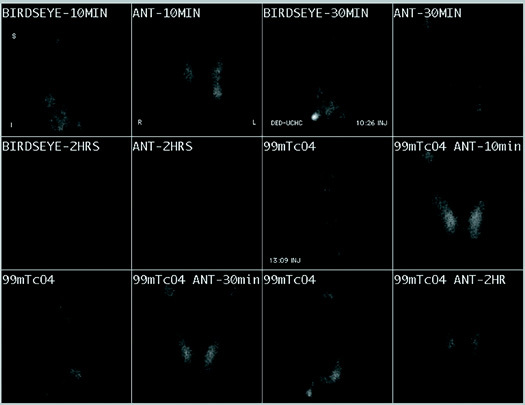 Delayed-phase images, obtained two hours after radiotracer administration, are used to look for foci of retained radiotracer characteristic of hyperfunctioning parathyroid tissue. Subtraction techniques are also used to image the parathyroid glands by administering a second radiotracer taken up only by the thyroid gland. Either I-123 or 99mTc-pertechnetate can be used in conjunction with 99mTc-sestamibi to produce subtraction images of the parathyroid glands. Over the past decade, surgical treatment of primary hyperparathyroidism has changed from a bilateral approach with four-gland exploration to unilateral/focused approaches guided by preoperative imaging of single adenomas. Surgery is successful in treating primary hyperparathyroidism caused by parathyroid adenomas in 95% to 98% of cases. 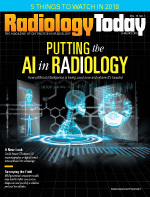 — Alex Merkulov, MD, is an associate professor of radiology at the University of Connecticut Health Center. 1. Matthews C, Matthews A, Safavi K. Clinical images: four-dimensional computed tomography — future of preoperative parathyroid adenoma imaging. Ochsner J. 2017;17(3):220-222. 2. Madkhali T, Alhefdhi A, Chen H, Elfenbein D. Primary hyperparathyroidism. Ulus Cerrahi Derg. 2016;32(1):58-66. 3. Sung JY. Parathyroid ultrasonography: the evolving role of the radiologist. Ultrasonography. 2015;34(4):268-274. 4. Vitetta GM, Neri P, Chiecchio A, et al. Role of ultrasonography in the management of patients with primary hyperparathyroidism: retrospective comparison with technetium-99m sestamibi scintigraphy. J Ultrasound. 2014;17(1):1-12.